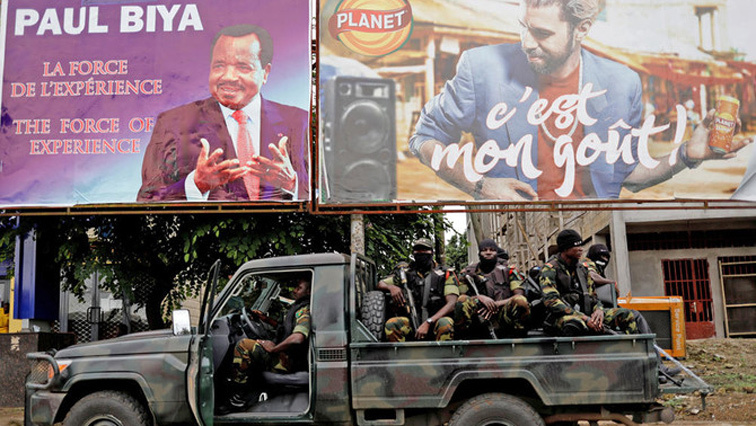 US halts military assistance to Cameroon over human rights concerns: Official - SABC News - Breaking news, special reports, world, business, sport coverage of all South African current events. Africa's news leader. Cameroonian elite Rapid Intervention Battalion (BIR) members pass under a placard of Cameroon President Paul Biya in the southwest city of Buea, Cameroon. The United States said on Wednesday it was halting some military assistance to Cameroon over allegations of gross human rights violations by its security forces in the northwest, southwest and far north regions. A State Department official said the United States had terminated a C-130 aircraft training program, and halted deliveries of four defender boats, nine armored vehicles and an upgrade of a Cessna aircraft for Cameroon’s rapid intervention forces. Cameroon has cooperated closely with the United States in the fight against militant group Boko Haram. “We do not take these measures lightly, but we will not shirk from reducing assistance further if evolving conditions require it,” the official said. This entry was posted on 07 Feb 2019,09:32AM at 9:32 AM and is filed under Africa, Homepage Featured Story Slider. You can follow any responses to this entry through the RSS 2.0 feed. Both comments and pings are currently closed.